For the first time, researchers from Tomsk Polytechnic University have produced polymers at room temperature under sunlight conditions, though this process usually works at high temperature. They employed surface plasmon polaritons (SPPs) as a “trigger” for a new kind of reactions. The outcomes of the research have been reported in the Journal of Material Chemistry A (IF: 9.931; Q1); the article also appeared in the 2019 top publications of the journal. The new theory of polymerization has already been verified at the production of “smart” or functional polymers whose properties can be modeled at the extraction stage. From the global point of view, we address the application of new energy sources for implementing chemical reactions. Many catalytic processes run at extremely high temperatures. At the industrial scale, these require enormous energy consumption. That is why we are challenged to reduce the temperature of reactions and to develop fundamentally new methods of energy supply to chemical reactions. In this regard, scientists pay special attention to light because it is a ‘green’ and eco-friendly source of energy. Usually, the production of polymers takes place at a temperature of around 150 °C. On one hand, it involves energy costs, while on the other, it is not possible to obtain all polymers with preferred properties and of needed quality under such conditions. The researchers used plasmon polaritons in order to overcome such issues. They take place near the surface of solids as a result of electron oscillations. In fact, they transform light energy, and due to this property, they prompt polymerization. “These particles allow us to carry out previously impossible things, which particularly implies carrying out reactions at room temperature under light exposure, i.e. laser or sunlight. In the article, we have demonstrated the opportunity to carry out controlled nitroxide-mediated polymerization (NMP). However, the exact operational mechanism of plasmon polaritons is not yet known. This is the next challenge for our research team and other scientists,” remarks Pavel Postnikov. During the research, the researchers produced polymers on the surface of thin gold plates, which has a maximum thickness of 20 nm. The surface of the plates has a wave-like structure. This structure enables the plates to efficiently activate plasmon polaritons. The scientists “planted” alkoxyamine molecules as a catalyst on the plate with N-isopropylacrylamide (NIPAM) monomer to be used as a building material. After that, the plate was subjected to laser or natural sunlight, and the experiments were carried out on sunny days in the open air. Upon being exposed to light, a PNIPAM polymer chain was produced from the monomer. Subsequently, the second polymer pVBA (a polymer based on 4-vinylbenzene boronic acid) was developed on this chain from the monomer. Both the polymers come under the functional class, meaning they have specific properties that chemists can set and use. For instance, at a temperature beyond 32 °C, PNIPAM becomes insoluble in water. Researchers employ this property when producing structures for the creation of artificial vasculature. These structures can be easily removed by just cooling PNIPAM. It is interesting that under sunlight exposure synthesizing was much in the same way as under laser exposure. Meantime, the structure obtained out of the gold plate and a functional polymer on its surface can be a very sensitive sensor itself. During the experiment, this sensor was used to capture various biological markers out of model solutions. The sensor turned to be very sensitive, it captured a necessary substance literally in trace amounts. Currently, the researchers demonstrated the results of the research at the laboratory scale, states Postnikov. 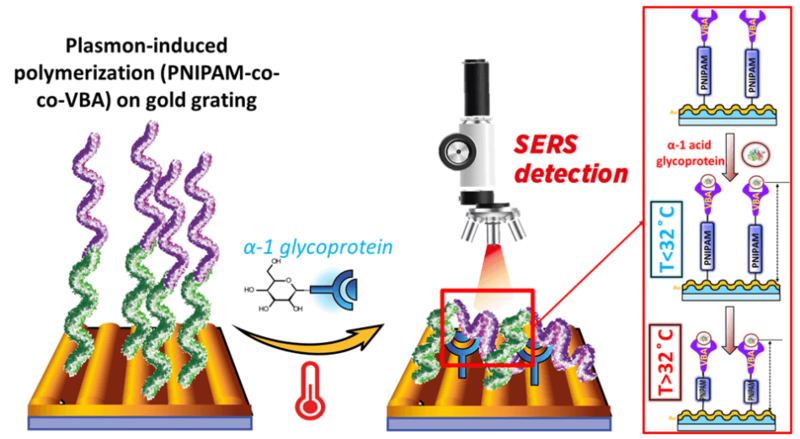 Eventually, the revealed processes can render polymer production more energy efficient and help researchers to produce supersensitive sensors for biological research and new polymers with useful properties.